Now that the holiday entertaining and gift-giving season is right around the corner, it’s time to start thinking about celebrations, entertaining and gift giving. One of my favorite finds for interesting gifts that you won’t see elsewhere is at Summerhill Ltd. in Old Towne Orange. Owner Denise Jochec is always on the lookout for beautiful tabletop pieces, art, silver, crystal stemware, porcelain and jewelry boxes that make great gifts. 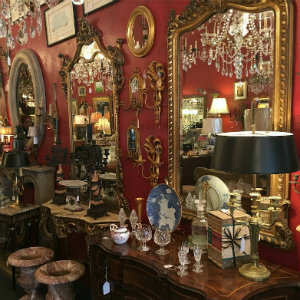 She even travels to Paris to find the best in French antiques and brings them back to her showroom with a hidden cellar below filled with even more treasures. 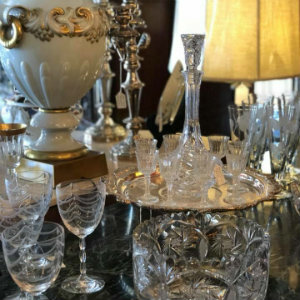 For entertaining, you could find a crystal pastry dome and plate, a crudité platter, hand-painted divided bowls, salt cellars, silver overlay glass pitchers with matching glasses, cocktail sets, platters, and dinnerware. 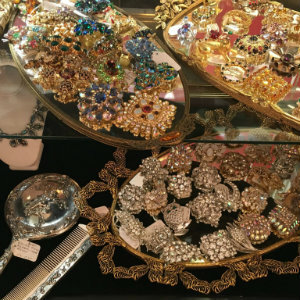 For other unique gifts, you can find antique and vintage one-of-a-kind jewelry from Juliana, Weiss, Eisenberg and more. Every few months, there are even special Crown Jewels trunk shows featuring locally handmade jewelry. You can also find beautiful animal figurines, lamps, chandeliers, and mirrors. Summerhill Ltd. Antiques and Design is open daily. Open 11 a.m. to 5 p.m. Monday; 11 a.m. to 6 p.m. Tuesday through Saturday; 12 p.m. to 5 p.m. Sunday. 110 S. Glassell St. in Orange. 714.771.7782.